Our collective efforts to decarbonize markets are not happening fast enough - at this point in time it seems almost impossible that we’ll meet the goal to limit global temperature increases to well below 2 degrees Celsius, as pledged by 195 policy leaders at the 2015 United Nations Climate Change Conference. Despite technological progress and many good efforts by governments, corporations and consumers, we continue to dump more, rather than less, gases that cause global warming into the atmosphere, largely due to the burning of fossil fuels and the industrial use of animal stock (see the International Energy Agency’s World Energy Outlook 2018). Despite the modest progress made so far, several recent developments indicate that we might be entering a new era of decarbonization and a new way of doing business that may ultimately lead to dramatic emission reductions. First, climate change is no longer a distant problem on the horizon that is discussed by scientists and activists only. The recent waves of natural disasters, wildfires, droughts and extreme weather have been urgent reminders of the effects man-made global warming has on our lives. The Intergovernmental Panel on Climate Change (IPCC)’s recent report has been a wake-up call for many decision makers. The report shows how a temperature increase of 1.5 degrees Celsius will cause significant health problems and social and economic dislocations. And a recent report by the U.S. government, the 4th National Climate Assessment, spells out the dire consequences for the United States. As evidence of the impact of climate change will undoubtedly intensify, our willingness to react will increase ever more over time. And as we are learning that markets do not function in isolation but depend on a healthy natural environment, ideas and technologies that enable low carbon and environmentally friendly economic growth are bound to become dominant forces. Value systems will change and so will valuation of well-being and market success. The speed at which this will unfold will depend on the degree of harmony between the different market actors. Second, the solutions required to tackle global warming are well known and available. What is missing is the political will to phase out old policies and to replace them with smart ones that encourage the protection rather than the destruction of our natural environment, and that put a price on carbon high enough to stimulate the growth of clean energy systems. The political track record so far has been mixed at best. Old dogmas are still shaping market systems. The myth that green growth comes at the expense of the economy is still cultivated in some circles which have a short-term interest to maintain the status quo. After all, there is still money to be made by burning the globe. Worse, geopolitics is back and trumps markets again. This raises the worrisome spectrum of turning back the clock to the dark ages. But there are also encouraging developments that point the way forward. Small economies such as Sweden and Costa Rica show that with the right policy alignments and the collaboration of the corporate and finance community, and with the support of the people, rapid decarbonization is not only possible, it is also highly profitable and an engine of long term growth, technological excellence and social wellbeing. These examples are inspiring, but of course over time the big powers will need to change as well and a new level of global cooperation is required. Irrespective of how big power rivalry will unfold, it is fair to assume that ultimately nature will force our hands, one way or the other. And maybe climate change will out of necessity become the unifying force of humanity and give the arms race a common enemy at last. Historians and philosophers have long known it: The Enemy is Us. We can also now witness bold actions by corporations around the world indicating that the time for major transformation has come at last. For example, the German company Volkswagen recently announced ambitious plans to spend over €40 billion through 2023 in the critical areas of electrification and e-mobility. This in turn will have a signal effect on suppliers and consumers and will expedite the use of renewable energy and smart power systems. The Chinese GEIDCO initiative is busy supporting the building of high voltage transmission lines that enable the transport of renewable energy in many countries over long distances and with minimal losses. In Norway and Sweden, numerous innovative partnerships are developing clean energy and digitalization solutions, covering areas such as shipping, heavy road transportation and “green battery concepts”. True, corporate actions have so far only had little impact on the overall picture. The 2017 Yale University study Who's Acting On Climate Change, for example, shows that if the commitments made by the 2,100 companies and 6,900 cities covered in the study were fully implemented, this would amount to a reduction of only 1.5 to 2.0 billion tons of CO2 emissions, less than 4% of the current 52 billion tons we collectively emit into the atmosphere every year. To reach greater scale and impact, many more companies and other non-state actors need to take bold climate actions. In the absence of policy incentives, it is hard to see how this will happen. However, not only corporations are on the move. Investors have increasingly been picking up the signal that climate change is affecting their portfolios. Since the launch of the United Nations-supported Principles for Responsible Investment (PRI) in 2005, the finance community has increasingly been integrating environmental, social and governance (ESG) factors into their analysis and decision making. Today, over US$ 20 trillion assets under management globally are now invested according to ESG factors (see The Remarkable Rise of ESG). Some investors are opting for divestment of fossil fuel options which have reached over US$ 6 trillion. Many mainstream investors, however, are adopting “soft transition” strategies that allow for proactive engagement and provide incentives for corporations to improve their emission footprint. As perceptions about risks and opportunities are changing fast, so do concepts of valuation. New tools such as Arabesque S-Ray and the forthcoming “Celsius Score” - which evaluates companies based on their climate performance - enable investors to relocate capital away from polluting companies or from companies that are unwilling to improve their climate footprint towards future-fit companies for whom decarbonization is a winning strategy. There is still much work to be done to improve disclosure and data availability. But thanks to digitalization and artificial intelligence, even fragmented data already enables investors to establish robust relationships between material corporate performance and financial valuation, and thus drive decarbonization. The alignment between sustainable finance and responsible business has all the ingredients to become a transformative force on an unprecedented scale. By showing that there is more money to be made by funding clean and green practices than by burning the globe, market-led changes not only accelerate decarbonization on a massive scale. They also show governments the way forward, and encourage them to take bold actions to replace outdated industrial-era policies with climate-smart policies which we ultimately need to defeat the climate change threat. Responsible investing is widely understood as the integration of environmental, social and governance (ESG) factors into investment processes and decision-making. ESG factors cover a wide spectrum of issues that traditionally are not part of financial analysis, yet may have financial relevance. This might include how corporations respond to climate change, how good they are with water management, how effective their health and safety policies are in the protection against accidents, how they manage their supply chains, how they treat their workers and whether they have a corporate culture that builds trust and fosters innovation. The term ESG was first coined in 2005 in a landmark study entitled “Who Cares Wins.” Today, ESG investing is estimated at over $20 trillion in AUM or around a quarter of all professionally managed assets around the world, and its rapid growth builds on the Socially Responsible Investment (SRI) movement that has been around much longer. But unlike SRI, which is based on ethical and moral criteria and uses mostly negative screens, such as not investing in alcohol, tobacco or firearms, ESG investing is based on the assumption that ESG factors have financial relevance. In 2018, thousands of professionals from around the world hold the job title “ESG Analyst” and ESG investing is the subject of news articles in the financial pages of the world’s leading newspapers. Many investors recognize that ESG information about corporations is vital to understand corporate purpose, strategy and management quality of companies. It is now, quite literally, big business. But what explains the remarkable rise of ESG investing and what does this mean for the future? The story of ESG investing began in January 2004 when former UN Secretary General Kofi Annan wrote to over 50 CEOs of major financial institutions, inviting them to participate in a joint initiative under the auspices of the UN Global Compact and with the support of the International Finance Corporation (IFC) and the Swiss Government. The goal of the initiative was to find ways to integrate ESG into capital markets. A year later this initiative produced a report entitled “Who Cares Wins,” with Ivo Knoepfel as the author. The report made the case that embedding environmental, social and governance factors in capital markets makes good business sense and leads to more sustainable markets and better outcomes for societies. At the same time UNEP/Fiproduced the so-called “Freshfield Report” which showed that ESG issues are relevant for financial valuation. These two reports formed the backbone for the launch of the Principles for Responsible Investment (PRI) at the New York Stock Exchange in 2006 and the launch of the Sustainable Stock Exchange Initiative (SSEI) the following year. Today, the UN-backed PRI is a thriving global initiative with over 1,600 members representing over $70 trillion assets under management. PRI’s role is to advance the integration of ESG into analysis and decision-making through thought leadership and the creation of tools, guidance and engagement. The SSEI, supported by the Geneva-based UNCTAD, has grown over the years with many exchanges now mandating ESG disclosure for listed companies or providing guidance on how to report on ESG issues. However, despite its rapid growth into the mainstream, the rise of ESG investing has been neither smooth nor linear. Institutional investors were initially reluctant to embrace the concept, arguing that their fiduciary duty was limited to the maximization of shareholder values irrespective of environmental or social impacts, or broader governance issues such as corruption. Incredibly, such arguments are still being made. But as evidence has grown that ESG issues have financial implications, the tide has shifted. In many important markets, including the U.S. and the EU, ESG integration is increasingly seen as part of fiduciary duty. See, for example, Al Gore's update on relevant developments. Another major barrier has been a lack of data and the necessary tools to get a handle on the fragmented and incomplete information available. However, corporate disclosure on ESG issues has steadily improved since the launch of the Global Reporting Initiative (GRI) in 2000. Today, 80% of the world’s largest corporations use GRI standards. More recently, the International Integrated Reporting Initiative (IIRC) and the US-based Sustainability Accounting Standard Board (SASB) have helped to advance industry sector-specific reporting and its relevance for investors. Overall, the market for ESG information is maturing and quality, while still imperfect, is getting better all the time. And new technology based on machine learning and big data can already unlock valuable insights and offer easy ways to apply ESG data in addition to conventional financial information. The steady growth of ESG investing was greatly accelerated around 2013 and 2014 when the first studies were published showing that good corporate sustainability performance is associated with good financial results. Work by academics such as George Serafeim, Bob Eccles and Ioannis Ioannou shows the importance of ESG information for assessing corporate risks, strategies and operational performance. The idea that investors who integrate corporate environmental, social and governance risks can improve returns is now rapidly spreading across capital markets on all continents. In Europe, for example, a critical mass of pension funds and insurers have started to award new business exclusively to asset managers with ESG capabilities. The global investor community has developed a variety of methods for optimally integrating ESG information, such as outlined in A Practical Guide To ESG Integration for Equity Investing). Among the many ESG factors that are viewed as having financial relevance are especially those related to climate change. The reason for this is that climate change is no longer a distant threat on the horizon, but one that is here and now, with multi-billion-dollar economic consequences. Many investor initiatives are now pushing for de-carbonization and the Task Force on Climate-related Financial Disclosures (TCFD) has given much impetus for improving risk preparedness and, by implication, de-carbonization actions. Cynics may argue that responsible investing is just a fad. But a closer look at the forces that have driven the movement over the past 15 years suggests otherwise. Firstly, technology and the rise of transparency are here to stay. Gathering and processing data will become ever easier and cheaper. Smart algorithms will increasingly allow for better interpretation of non-traditional financial information which seems to be doubling in volume every couple of years. Secondly, environmental changes, in particular climate change, will with scientific certainty put a growing premium on good stewardship and low carbon practices as natural assets will appreciate in value over time. And thirdly, people everywhere are increasingly empowered by technology. ESG investing allows them to express their own values and to ensure that their savings and investments reflect their preferences, without compromising on returns. The rise of ESG investing can also be understood as a proxy for how markets and societies are changing and how concepts of valuation are adapting to these changes. The big challenge for most corporations is to adapt to a new environment that favors smarter, cleaner and healthier products and services, and to leave behind the dogmas of the industrial era when pollution was free, labor was just a cost factor and scale and scope was the dominant strategy. For investors, ESG data is increasingly important to identify those companies that are well positioned for the future and to avoid those which are likely to underperform or fail. For individuals, ESG investing offers the opportunity to vote with their money. And for policy makers, it should be a welcome market-led development that ensures that the common good does not get lost in short-term profit making at any cost. Today, ESG investing has matured to the point where it can greatly accelerate market transformation for the better. As corporations and investors experience growing influence and power, their actions and decisions increasingly shape the future. Provided that political framework conditions based on openness and global rules do not deteriorate further, market-led changes will act as a force for good on a truly massive scale. The $2.5 trillion fashion and apparel industry is an economic heavyweight. One of the largest consumer industries, it employs over 60 million people along its global value chain. For many emerging markets it is a stepping stone out of poverty with women making up over 70% of the supply chain. Consumers in the developed world have become used to fast fashion and cheap clothes as a throw-away commodity that mostly ends up in landfills. And the trend towards ever shorter life cycles of apparel does not yet seem to have plateaued. The average consumer today purchases 60% more clothing than 20 years ago. Each garment is kept half as long, and about 40% of clothes in the wardrobes of developed countries are never worn, as estimated by the United Nations Economic Commission for Europe. 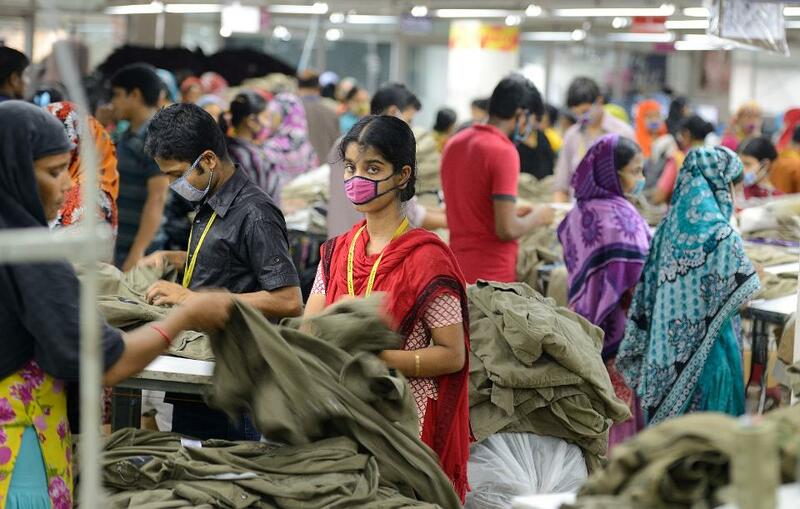 The often-dismal workplace conditions that supply our growing consumption came to light five years ago when the Rana Plaza building in Bangladesh collapsed, causing the death of over 1,000 textile workers, mostly young women. Leading brands have since then committed to safer factories, and a number of action groups and ethical clothing initiatives are now tracking performance and are shining a light on the value chain. But studies by Oxfam Australia show that little has changed regarding social conditions, in particular minimum wages, to enable decent living conditions. As concerns about water scarcity and climate change are on the rise, the industry’s enormous environmental footprint has been moving center stage as well. By some estimates, the fashion industry is responsible for up to 10% of global CO2 emissions, 20% of the world’s industrial wastewater, 24% of insecticides and 11% of pesticides use. Executives know very well that their current business model is not future-fit. In the absence of global rules or major changes on the consumer side, the fashion industry is now carefully exploring options on how to improve its social and environmental impact while successfully operating in a highly price-competitive environment. Reinventing an industry built on growing consumption, cheap labor, free public goods such as access to water and environmental pollution is not an easy undertaking. Good old as well as new ideas are floating: regenerative agriculture, organic cotton, living wages in the supply chain, and reusing fibers to create circular material flow. One of the more promising market-based approaches is being pursued by the New York-based Glasgow Caledonian University (GCNYC) Fair Fashion Center, which acts as a research and action center for 35 CEOs representing 242 brands in the fashion industry. After several rounds of CEO meetings and exchanges of research and ideas, an innovative project is now under development that has the potential to change the industry from within. With a grant from the Rockefeller Foundation and in collaboration with GRIPS Energy AG, the No Carbon Dioxide (NoCO2) initiative seeks to tackle both social conditions and the environmental footprint. The basic concept of NoCO2 is simple: provide the impetus to replace costly and dirty diesel power used by the independently owned factories that supply fashion brands with clean energy and direct the savings associated with it to the factory workers. Feasibility studies have long shown that such an energy switch is viable through flexible power purchase agreements, provided that initial funding and ongoing incentivizing is available. NoCO2 aims to accomplish this through a blended finance model that also involves consumers who will be able to “round up” their e-commerce purchases in support of the initiative. NoCO2 will be launching later this year. As a pre-competitive initiative, it has the potential to bring systemic change on a very large scale to the fashion industry. For executives it will offer the opportunity to boost their brands and improve the level playing field while at the same time improving social and environmental conditions. It is hoped that executives are willing to step up and collaborate, in the industry's own interest and for the benefit of all. In a December 2017 interview, Volkswagen CEO Matthias Mueller suggestedthat it is time to replace subsidies for diesel with incentives that support the electric vehicles: “I’ve become convinced that we should question the sense and purpose of the diesel subsidies. If the switch to environmentally friendly e-cars is to succeed, diesel combustion engines can’t continue to be subsidized the way they have been forever”. These words from a major diesel producer sparked a national and European debate, as nearly half of all new cars sold in the EU run on diesel. This move could well trigger a transformational shift in the transportation industry. The Volkswagen story is an example of corporate statesmanship. We believe that there is now a strong case for CEOs to take a bolder role in public affairs to address some of society’s major issues. In politics, statesmanship designates the skill of managing state affairs, while a statesman is “a wise, skillful, and respected political leader”¹. Statesmen place the common good above their own interests and actively work to shape the context. Because they control wealth, the fate of employees and choices on their products, CEOs are influential political players, whether or not they realize or exercise their power. They can therefore realistically aspire to statesmanship by acting for the common good, and not just the immediate interests of their companies. We can define corporate statesmanship as the action of a company, and in particular of its CEO, to intervene in public affairs to foster collective action in support of the common good beyond the scope of their enlightened self-interest. Social stresses abound and 2018 may well prove to be a moment of truth for CEOs, especially in the US, where companies will be under greater scrutiny because of tax reductions and regulatory relief. The societal challenges we face are well-known. Inequalities have been strongly increasingly over the last 3 decades, although slower in Europe than in the rest of the world (figure 1). The rise of a new protectionism is part of a backlash against globalization that is starting to impact business itself. The capacity of technology to foster progress and economic development is being questioned. The development of AI and robotization are increasingly feared as threats to employment rather than drivers of opportunity. Another major challenge is the declining ability of the public sector to protect public goods, and in particular the environment. The latest research shows that despite the technologies at our disposal, we will likely miss Paris climate targets. And a growing world population will place further stress on the environment: irreversible biodiversity losses, water scarcity, lack of arable land and pressure on protected areas all seem likely to intensify. Traditionally, we would expect governments to address these issues. In most of the world, there is a historic division of roles where corporations drive economic activity while governments take care of the common good. As a result, there is an understandable reluctance for firms to get involved in public affairs. And allowing companies a stronger role can certainly create conflicts of interest, akin to having the fox watch the hen house. Numerous historical cases of failures of self-regulation support this view. Alan Greenspan, former Chairman of the Federal Reserve, famously claimed: “I made a mistake in presuming that the self-interest of organizations was such that they were best capable of protecting their own shareholders”. There are strong reasons to believe that governments may not be in a position to address some of today’s challenges by themselves. The scope and scale of some of the challenges are arguably too broad even for large individual states, while weakening global cooperation reduces the chances for collective action. Political cycles limit the ability of governments to address long-term issues. On average, there are 1.7 national elections every quarter in the EU, undermining the continuity needed to attack long term challenges. And increasing political polarization further limits opportunities for public action in many parts of the world. Financial pressures also contribute to institutional fragility and constrain public action. 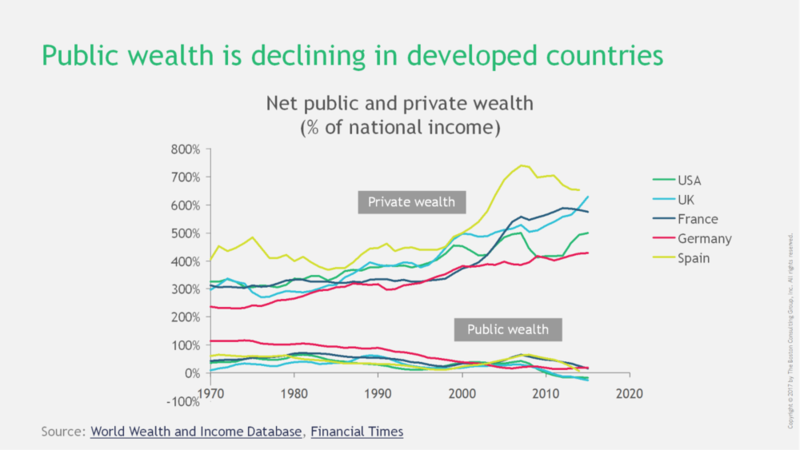 The welfare state is reaching its limits in developed countries, driven by aging and a shift from public wealth to private capital (figure 2). The picture becomes even more complex if we consider the compounded effect of these various challenges. For instance, a 2016 article demonstrates that “Income inequality has a large, positive and statistically significant effect on political polarization”. As a result of these and other factors, confidence in governmental institutions is falling, which further reduces the power of states as change agents. According to the Pew Research Center, public trust in the government is near historic lows in the US. Only 18% of Americans today say they can trust the government to “do what is right”. Given this, there is a strong case for corporations to step up their statesmanship. Of course, many CEOs fear that a more public role might generate exposure to backlash, especially in a context of increasing skepticism towards institutions. According to a recent survey, while 38% responded that CEOs have a responsibility to speak out on controversial issues, 36% said they believe the top reason for CEO activism is “to get media attention” (HBR, 2016). As in post-war Japan, corporations are economic giants but still political dwarfs. Leaders tend to focus on immediate business problems: only 2% of board directors see “the role of business in society” as having the greatest effect on their company over the next 12 months (NACD 2017–2018 Board Survey). However, the risk of acting needs to be balanced against the risk of inaction. If they stay passive, firms could soon find themselves damaged by an environment of escalating political risk. Ultimately, consumers and society have the power to sanction or restrict the freedom of action of global corporations. Regardless of political inclinations, corporate leaders have a common interest in preserving the game of business and defending the drivers of growth, like technology and globalization. Corporations don’t just have a self-interest to step up, they also well positioned to do so. Fundamentally, they are effective at problem-solving. They can act globally, in contrast to national governments. They have access to access to resources, skills and technology. Profits and cash accumulation are at historical highs, especially in the United States with recent corporate tax reform, so there is a large margin for action right now. As the influence of business has grown so has its ability to shape the provision of public goods essential for market stability. Ultimately business cannot succeed if societies fail. Global markets need global rules for business to play its proper role in creating wealth and spreading solutions. The business community is increasingly stepping up on sustainability and Corporate Responsibility (CR), not least because of growing evidence of a positive link with financial performance. The recent ascendancy of sustainable investing, enabled using tools such as the Arabesque S-Ray,will further accelerate good practices across industries. This alignment of finance with CR will could make a significant contribution to society in terms of environmental stewardship, workplace conditions and good governance. In essence, CR is a long-term maximization of self-interest in which companies ensure that they don’t damage themselves by undermining their own environments. CR is fundamentally about individual action, in ways which are compatible with common interest — in other words, “doing well by doing good” within an existing policy framework. By contrast, statesmanship goes a step further. It is about shaping the policy framework to advance the public and private interests and changing the game by influencing the collective will (figure 3). It tackles problems that can’t be resolved through the enlightened self-interest of individual companies. The Prisoners’ Dilemma is used in economics to describe the situations where without collective action all actors tend to undermine each other, which leads to suboptimal individual outcomes. In other words, because each company follows its own path, an entire industry or economy ends up hurting itself. In those cases, statesmen are need to foster cooperation and lift everyone to a better equilibrium by changing the nature of the game. Cybersecurity is a good example of a prisoners’ dilemma in business. Everybody has a direct interest in seeing their data protected: citizens, consumers, producers and creators alike. But nobody has an interest in investing too much in the security of their own systems. This leads to systemic vulnerability, where breaches of security caused could have a negative impact on all and literally take down companies. A good statesman has to be a good citizen. Gaining trust requires behaving responsibly, and being perceived in this light by other stakeholders. Maximization of Total Shareholder Return (TSR) within given legal boundaries is not enough. Leaders need to define clearly a human purpose, the higher social goal which their corporation serves, and ensure that their impact is compatible with that purpose. And they need to ensure that their own operations are based on values and a commitment to integrity. A good start is the assessment of your firm’s economic, social, environmental and political impact. To this end, BCG recently developed a new metric called Total Societal Impact (TSI), which can be used to lay the foundations for a sound sustainability strategy. Above being a good citizen, statesmen need to protect the rules and institutions which guarantee balance in society. Companies benefit from a “license to operate” from society. Statesmen understanding the underlying conditions of the game, and the lines that cannot be crossed without jeopardizing their license to operate. For example, Allergan CEO Brent Saunders acknowledged that “The health care industry has had a long-standing unwritten social contract with patients, physicians, policy makers and the public at large”. Perceived breach of that contract could threaten the entire industry: “As the focus on price has heated up, the innovation ecosystem has come under assault, and it is fragile”. To protect the game, Allergan offered a new “social contract” to patients, with a focus on responsible pricing. The company then argued for industry-wide action, along with other CEOs. Recent data suggests Allergan’s commitment on pricing may be shaping de facto industry norms. In developed economies too, corporations should support the role of the state as regulator and referee. Elon Musk’s letter calling for the banning of autonomous weapons, which select and engage targets without human intervention, is an example of embracing regulation for social good. His letter clearly states that this about protecting the game and preventing: “a major public backlash against AI that curtails its future societal benefits”. Empowering governments is a first step, but corporate leaders also need to propose and support smart regulations to preserve social balance. A case in point is the financial industry, which is highly complex and interconnected. It shares many features with biological systems, where all actors benefit from the ecosystem. In such situations, actors that over-stretch the system by systematically maximizing their private benefits may provoke collapse that is ultimately detrimental to their own interests. Because statesmen are aware of those dynamics, they address a wider responsibility and support regulations that underpin a sustainable future for their industry. ExxonMobil’s CEO Darren Woods realizes that “growing demand creates a dual challenge: providing energy to meet people’s needs while managing the risks of climate change”. Therefore, in his first blog post as CEO, he advocated a “uniform price of carbon applied consistently across the economy” as the smartest way to meet that dual challenge. When confronted with situations that are obviously unfair, the right response of the statesman is to take action. As Elie Wiesel put it, “We must take sides. Neutrality helps the oppressor, never the victim”. Assessments of “right” and “wrong” should be informed by universal values and principles that we have learned from history. · Voice, public communication of disapproval. “Voice” may generate exposure for a corporation. One option for CEOs to mitigate such a risk is to distinguish their opinions as citizens from those of their companies. Sergey Brin attended demonstrations in his personal capacity, not as President of Google. This can be a good way to respond without the company appearing to customers and stakeholders as politically biased. The major issues of society are well-known. Sometimes even the solutions are obvious but political, social or economic conditions prevent those solutions from being implemented. Statesmen do not use this as an excuse and will instead take the lead and demonstrate that action is possible. In the cybersecurity example mentioned above, Google built a group of hackers called Project Zero, in order to identify and address digital threats, with a focus on the software made by other companies. This is a tangible way for Google to show that it takes responsibility for the overall stability of the system. Leadership and exemplification are meant to trigger collective action. For businesses, the rationale for engaging with others is not just about maximizing impact. Acting together with other industry players is also a way to ensure that the conditions of competition remain fair and equivalent for all. CEOs can help form and shape such coalitions to realize their values. There are many ways to do this, but the UN Global Compact has been decisive in providing a unified framework for business coalitions across a wide array of sustainability principles based on universal values. In a particularly striking example, 400+ companies including Microsoft, Adidas and Sony have committed to being climate neutral, i.e. to minimize their greenhouse gases emissions, and compensate for unavoidable emissions. Businesses should not be afraid to engage with other types of actors too: the climate coalition also includes individuals, cities and non-profits. CEOs have a direct legal responsibility toward their shareholders. This is often used as an argument for business leaders to remain within the strict limits of their assumed mandates, and focus on the maximization of TSR. However, there are now many examples of investors pressuring leaders to take a stand on societal issues. In January 2018, two Apple investors pressured the company to address concerns over smartphone addiction. They requested management to better assess the mental health effects on children, and take appropriate action. Neglecting this type of pressure might come at a high price. Norway’s pension fund, the world’s largest sovereign wealth fund, which owns on average 1.3 per cent of every single listed company on earth, decided to divest from oil and gas as part of a climate change strategy. Sustainable investing enabled by technology and big data analysis, as advanced by firms like Arabesque, is making investors increasingly powerful allies for corporate statesmen in addressing social challenges. It is often impossible for even informed citizens to know all of the facts, which are in any case often disputed, especially in the case of controversial social issues. People understand reality individually and collectively through stories. Statesmen exert influence and shape minds and foster action through narratives. CEOs need to explain why they believe what they believe and advocate for it by building understandable and compelling narratives, which not only stand up to scrutiny but which can create alignment and support. Lyft co-founder John Zimmer is well aware of a risk of backlash against new forms of mobility. So he tries to argue that car sharing is more than a business, that it has a huge impact on the design of cities, with “tremendous implications on global economics, health, social equality, the environment, and overall quality of life”. This puts the company in a better position to shape the future of the industry. Business leaders need to face the inconvenient truth that some aspects of collective welfare can’t always come from individual maximization efforts, even enlightened ones. They require the “technology of leadership” to solve the prisoners’ dilemma of non-cooperation leading to poorer outcomes for all. Corporations that lead will be trusted more and accepted as a partner by governments and citizens. Actions will foster more actions, and 2018 could well be a foundational year for corporate statesmanship. Georg Kell is Chairman of Arabesque, an ESG Quant investment firm and founder and former head of the UN Global Compact.